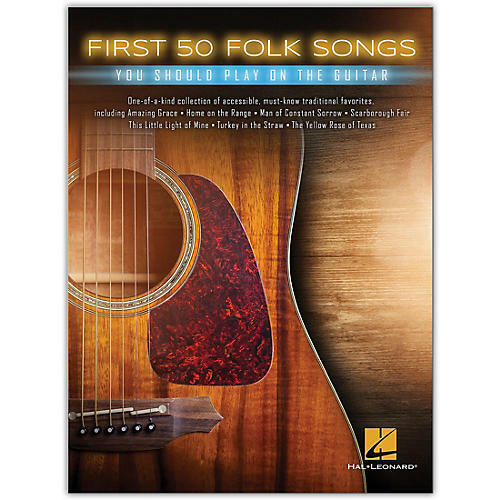 Start your guitar playing guitar with this one-of-a-kind collection of accessible, must-know traditional folk favorites. Includes easy guitar arrangements in notes and tab with lyrics of 50 songs: Amazing Grace · Buffalo Gals (Won't You Come Out Tonight?) · Down by the Riverside · Good Night Ladies · Home on the Range · I've Been Working on the Railroad · Kumbaya · Man of Constant Sorrow · My Old Kentucky Home · Nobody Knows the Trouble I've Seen · Oh! Susanna · The Red River Valley · Scarborough Fair · She'll Be Comin' 'Round the Mountain · This Little Light of Mine · Turkey in the Straw · When the Saints Go Marching In · Will the Circle Be Unbroken · The Yellow Rose of Texas · and more.